The Palace of Holyroodhouse has played a central role in Scotland’s history ever since its foundation as a Augustian monastery by King David I of Scotland nearly 900 years ago. Rebuilt by James V of Scotland to include a large tower and a new west front. The Palace was to become the home of his daughter, Mary, Queen of Scots, and the scene for many of the most dramatic and tragic events of her reign, culminating in the murder in the palace of her secretary, David Rizzio in 1566. Rebuilt again by Charles II after the Civil War, the palace became a showplace of baroque architecture and interior decoration. 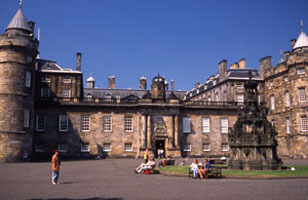 It was the Edinburgh headquarters of Bonnie Prince Charlie in 1745, a refuge after the French Revolution of 1789 for the future Charles X of France, and from the time of the State Visit of George IV in 1822, one of the foremost attractions for visitors to the Scottish capital, drawn to it as much for its associations with Scotland’s past as for the role it plays today as The Queen’s official residence in Edinburgh. The palace now also houses a significant part of the Royal Collection, with paintings and works of art on display both within the palace itself and in adjacent The Queen’s Gallery.